In America, love does not trump hate. 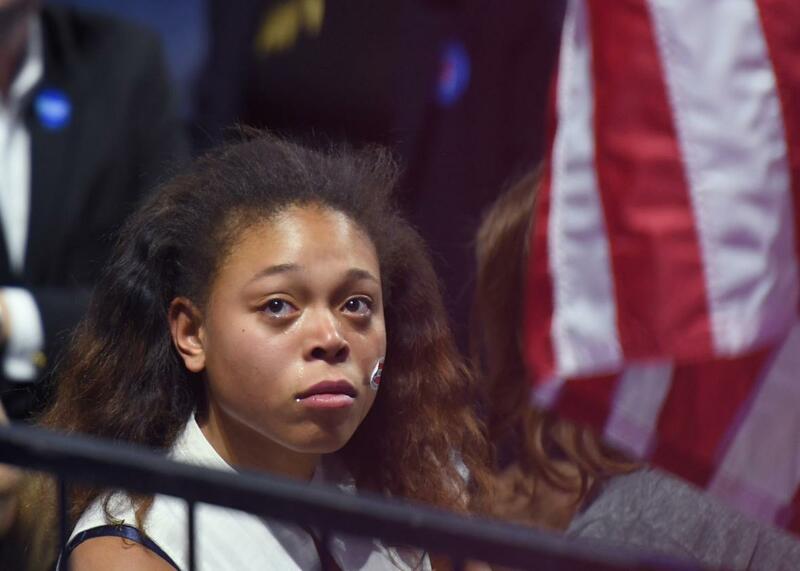 A supporter of Hillary Clinton reacts to TV reports during election night at the Jacob K. Javits Convention Center in New York. On the way to the Javits Center in Manhattan on Tuesday night, I got three separate bouts of the chills. I thought about what it would mean to be in the room when the first female president of the United States took the stage to accept that honor in a room full of her hardiest supporters. I’d photograph their tears as they celebrated a historic triumph over an apocalyptic symbol of this country’s misogyny, racism, and fear. Instead, I ended up stuck in a basement with a couple hundred other reporters, watching in shock and horror as the results rolled in on projection screens playing CNN and MSNBC. The Clinton campaign had accredited all of us but allowed just a select few into the main room. The rest of us sat in a sea of narrow plastic tables, trying to adjust to increasingly grim election results none of us expected. Most of them had at least one or two co-workers to commiserate with and perform for, keeping composure and relative cheer through most of the night. Alone with my laptop and baggie of drugstore cashews, I was in visible throes of despair. When people started tweeting that Clinton was going to lose Florida, I could feel the blood drain from my extremities. When it turned out Virginia was in play, I looked around wide-eyed, wondering how my peers were holding it together, still joking and grinning and shrugging while I imagined what Trump’s acceptance speech might sound like. I locked eyes with one camera operator, a woman of color I clocked as a fellow queer. Our faces were blank. This is the first election I’ve spent alone. In 2008, I watched the country elect Barack Obama with a crowd of fellow students in an on-campus apartment at Georgetown University. We ran to the White House—literally ran, screaming, for two-and-a-half miles—when he won. I’d come of political consciousness in the George W. Bush era, convinced I didn’t belong in a country that supported his proud ignorance, homophobia, and wielding of religion as a punitive cudgel. Obama’s election convinced me our country was better than that. I watched the 2012 election with my partner and her co-workers at her office. After the results came in, we biked to the White House, then up to the U Street corridor, a neighborhood with a rich black history, for an impromptu block party. Tonight, I tried to envision my future from a folding chair, alone in a crowded basement, texting my partner for reassurance that our lives could still be OK, as she sat in a living room with a gaggle of our friends. I frantically projected how my life would look under Trump’s Supreme Court, grasping for any thread of hope that the protections my partner and I have planned around might still exist four years from now. I stared at Rachel Maddow’s face when the screens changed to MSNBC and wondered whether she shared my creeping sense of dread for our queer lives in the USA. Too disgusted and drained to care about how I looked, I typed this post through two crying jags, watching the country turn its back on me, my fellow women and LGBTQ people, Muslims, immigrants, and all people of color. With no hand to hold or colleagues to make me laugh with stupid jokes, I contemplated what it might mean to live in a nation that’s chosen to elect a sexual abuser and white supremacist with no political experience. “Did you ever think this would happen?” the British videographer to my left asked me, a smile on his face. I could barely stifle a scream. I did my job alongside hundreds of strangers doing the same, as we all realized that the stories we expected to tell would not come true. The woman typing in Thai on my right, the video crew scribbling cue cards in Mandarin, the man of color on the production crew staring emptily at his cellphone, the all-female PopSugar contingent filming cheery clips, me with my cashews—we would all suffer in measurable and intersecting ways under a Trump presidency. We kept working as the news came down. Most of my professional peers held it together. I didn’t. After a while, the emotional neutrality in the Javits Center basement started to feel like a bulwark against whatever chaos we might find when we stepped into the chilly, barricaded streets of the West Side. The world is a different place now. Tonight was not a victory for Donald Trump or a loss for Hillary Clinton. It was a statement about the power of fear, anger, and hatred of the other. Love does not, as Clinton’s campaign had it, trump hate. Here in my folding chair, surrounded by people I don’t know in a country I don’t recognize, I feel more isolated than I’ve ever been. And yet, I’m not ready to leave this bubble of composed TV broadcasters and professional competence and deadlines being met. Right now, I don’t want to go outside.